No band summed up the freewheeling spirit of Nineties rock like the Breeders. They did not wear shoulder pads. They didn't do lipstick. They didn't even seem to wash their hair. They just seemed to roll out of bed in the afternoon, grab a guitar from the floor and transform into American rock goddesses. But Kim Deal and her ragged crew of Ohio players ruled the summer of 1993 with their classic second LP, Last Splash. In the aftershock of Nirvana, amid all the controversies over grunge and riot grrrl, the Breeders were the one band everybody could agree to love. Nobody really knows how it all happened – not even the Breeders. "We never thought anyone would hear us," Deal says now, with her hearty Midwestern laugh. "There was no intention of getting on the radio, ever. When we started, if you did get on to the radio, it meant there was something weirdly wrong. Like Paula Abdul." At first, while Deal was playing bass in the Pixies, the Breeders were just a side project. But as the Pixies fell apart, the Breeders stunned the world by becoming a great band in their own right, with Kim's twin sister, Kelley, British bassist Josephine Wiggs and drummer Jim Macpherson, an old pal. They even crashed Top 40 radio with the freak hit "Cannonball," a blast of art-punk feedback, with Kim promising to be "the bong in this reggae song." In the realness and rudeness of the music, you could hear the Deal sisters' stubborn sense of small-town heartland independence. As Deal says, "Back in Huber Heights, Ohio, there was only rock radio. Not Smashing Pumpkins rock radio – Molly Hatchet rock radio. Then, in the Eighties, the kids got into the Cure, Gene Loves Jezebel, and who's that guy with the black hair? Oh, yeah, the Cult. But that didn't exist in the Midwest. Punk rock never happened here. If you wanted to hear cool music, you had to seek it out yourself. So we did." Even by Nineties standards, the Breeders prided themselves on a slack approach. After Kelley Deal's 1994 heroin bust, the bandmates went on a long hiatus; they didn't manage another album until 2002, regrouping with assorted backup dudes. But while the Breeders have gone through many changes since 1993, one thing remains the same: no shoulder pads. 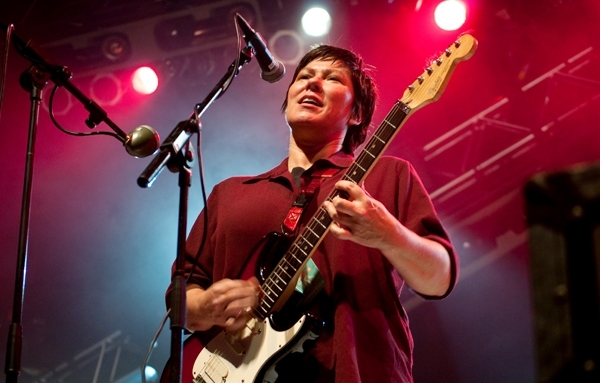 "I had such a hard time with that, man," Kim Deal recalls with a laugh. "David Lovering, the drummer for the Pixies, his mom would give me such grief backstage at our shows. She said, 'You need to put on some makeup, get some chunky silver earrings and a jewel-encrusted bustier.' " But the fashion advice never took. "I would stand in the kitchen, and my mom would take out her shoulder pads and shove them under my shirt," Deal adds. "I would just shake my head and say, 'Mom, it's just not gonna happen.'"